We have recovered over 3,700 TB data of failed RAID arrays, saving our clients thousands of dollars! RAID 1 – Mirrored Set. RAID one is a popular configuration for end users. It allows for total data redundancy with a minimum of performance degradation. The theory is that if one of the drives in the array degrades the other drive takes over totally and the user is notified with either an alarm from the card and possibly an email. The problems we at Eboxlab have seen when recovering a mirrored set are as follows. 1. Mirrors get corrupted. Bad data from one drive may propagate itself onto the mirror. 2. Mirror breaks and try to boot from single drive. Operating system still does not boot due to mirror meta data. 3. Upon a rebuild the wrong drive is pointed to. RAID 0 optimizes drive space and disk I/O but has no data redundancy. RAID 0 writes alternate blocks of data on each drive using a defined stripe size. Not only do you get the full use of all disk space but I/O is spread across all the drives in the array. This makes for faster reads and writes. In order for a recovery from this type to be successful all the drives must have the capability of being addressed. Standard stripe size is 128K, 256K. RAID 5 optimizes drive space and allows for a great deal of data redundancy. There is a throughput bonus since there are multiple disks, but there are some calculations that are made in order to create a parity block. RAID 5 uses a stripe, broken into blocks. One block in each stripe is not a data block, it is a parity block. Using XOR mathematics it is possible to lose one drive and still run. Once a second drive is lost the array fails. There are several problems involved in this type of RAID recovery. 1. One drive is marked as drive by the card as bad and the array is degraded. The drive is forced online and the data gets corrupted. 2. One drive is marked by card as bad and the array is degraded. Drive is not replaced and the array continues to function. Second drive goes down and array goes down. It is not clear which drive went down first and it becomes difficult to determine which drive has stale data. 3. An automatic rebuild is started and the wrong drive is used as a rebuild point. 4. Drives are taken out of array and put back in enclosure out of order. There are many other problems associated with RAID 5 data recovery, but the above are the most prevalent. All the disk devices are organized alternatively so that blocks are taken equally from all disks alternatively, in order to reach higher efficiency. Since the probability of finding a block of a file is identical for all disks, there are force to work simultaneously thus making the performance of the meta disk almost 10 times that of a single disk. In this mode, the goal is to reach the highest security of the data. Blocks of data are duplicated in all physical disks (each block of the virtual disk has a duplicate in each of the physical disks). This configuration provides 10 times the reading performance of a single device, but it degrades writing operations. Read operations can be organized to read 10 blocks simultaneously, one from each device at a time. Similarly when writing 1 block it has to be duplicated 10 times, one for each physical device. There is no advantage in this configuration regarding storage capacity. In this mode the ultimate goal is to balance the advantages of the type RAID 0 and RAID 1. Data is organized mixing both methods. The physical 1 to N-1 are organized in striping mode (RAID0) and the Nth stores the parity of the individual bits corresponding to blocks 1 to N-1. If any of the disks fails, it is possible to recover by using the parity information on the Nth hard disk. Efficiency during read operations is N-1 and during write operations is 1/2 (because writing a data block now involves writing also to the parity disk). In order to restore a broken hard disk, one only has to re-read the information and re-write it (it reads from the parity disk but it writes to the newly install hard disk). If your drive has been exposed to natural or man made disaster (fire, water, etc..). Do not apply power! Make sure it is packaged in some form of waterproof container until it can be examined by a data recovery professional in a clean room environment. Powering up the unit may cause permanent damage to the data and eliminate the possibility of recovery. 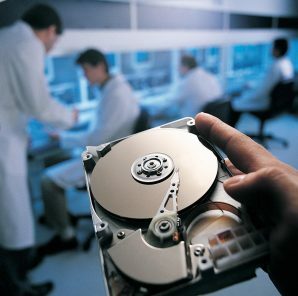 Your media requires the services of a data recovery professional. Eboxlab does not participate in the “high/low” pricing quote model. (Typically between $700-$5000.00) We have found that most companies tend to charge on the high end of the quote range. Some recovery companies also have a tendency to exaggerate turn around times . We understand that this can be a stressful time for you and believe that you should be fully informed in your recovery process. The catastrophe….In today’s digitalized age, many of us never consider the massive importance of the IT infrastructure. As we sit at a health care professionals office waiting for our treatments, the idea that our personal health history is safeguarded. The prospect of ever losing this data is unfathomable to us or the Doctors running the facility. Unfortunately Mother Nature likes to keep us on our toes. After an incredibly violent thunderstorm and a direct hit from a lightning strike, the existing IT structure went down for the count. The Server was run by Red Hat enterprise, which posed a need for additional specialization. The IT department realized almost immediately they needed the specialists at Eboxlab to help them with their dilemma. Not a second was to be wasted, the data on the server contained prescriptions and treatment routines for patients at a cancer outpatient facility. The team here at Eboxlab showed true dedication in rectifying this situation. Our emergency services protocol was put into place to minimize the operational downtime, and the team cancelled all weekend plans and ended up working on a resolution all throughout Friday and Saturday night to secure the data and restore the hardware to full operational force. Luckily our team has certified technicians to handle all sorts of operating systems, RAID setups and hardware configurations. The Data and the operational server was returned to a very grateful IT department. In our eyes, the clients have more important things to worry about.